Duplicate MP3 Finder is an innovative tool that can recognize duplicate audio files even if they are stored in different file formats and not marked with ID3 tags. In addition to analyzing the artist, title, album, etc. information from the ID tags contained in the audio files the tool will perform a true audio analysis and recognize similar audio files even if the information is missing. Duplicate Mp3 Finder will find fast all similar or exact duplicate audio files in a folder and its sub folders letting you organize your audio collection. 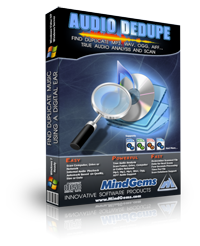 Supports MP3, MP2, MP1, MPA, WAV, OGG, AIFF, AAC, MP4, FLAC, AC3, WavPack (WV), Musepack (MPC) and Windows Media Audio (WMA) file formats. After numerous downloads from the Internet most home or corporate networks are scattered with duplicate music files. Keeping this redundant data is a waste of valuable disk space. 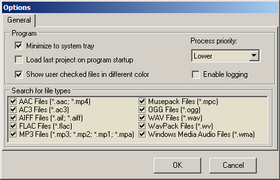 The duplicate audio finder tool can recognize it quickly and list the duplicate audio files by quality, date, seize etc. in order to let you keep only the files with the best quality. In addition to organizing your music collection Removing duplicate music files can free up gigabytes of wasted disk space as multimedia files are usually quite large. Duplicate MP3 Finder is a powerful utility for finding similar or exact duplicate audio files in a folder and its subfolders. 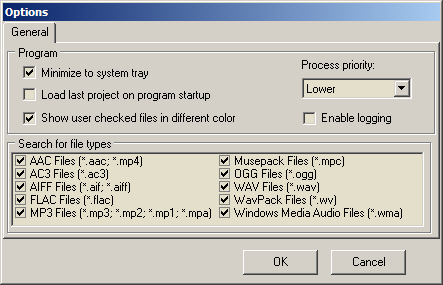 Find all similar or exact duplicate audio files in user specified folders, computers, entire network, usb storage etc. Mark audio files with lower quality for deletion - list can be sorted by bitrate, duration, size, date etc.